This summer, the Rosslyn BID is partnering with local startup Sprynt to bring you free, on-demand rides within the Rosslyn-Ballston corridor. Sprynt's fleet of funky looking electric cars, which you'll see circulating in Rosslyn starting in late April, are hard to miss: they're kind of like modern-looking, stretched-out British black cabs. Sprynt is a ride-sharing service. 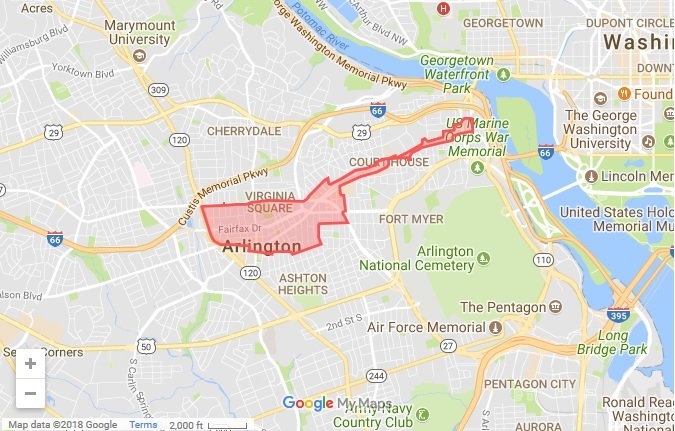 Download the free Sprynt iPhone app and use it to reserve a ride anywhere you want to go in the surrounding area (roughly from here to Ballston, as depicted on the map below). The rides are all free. Service is funded through advertising, which riders will see on the app or in the backseat of their ride. "As our summer events season ramps up, we hope people will take advantage of the Sprynt service to get outside and enjoy Rosslyn," says Rosslyn BID Senior Events Manager Sophie Barral. "For instance, on a Friday night, you can have dinner at Barley Mac, Quinn's on the Corner, Kona Grill, Heavy Seas Alehouse or someplace else in Upper Rosslyn. Then, get a free ride down the hill in a Sprynt car just in time to catch a terrific film at Rosslyn Cinema. Or go for dinner or drinks somewhere farther afield, like a spot in Clarendon or Court House. Or catch a ride to Whole Foods. Do your grocery shopping and get a free ride back to Rosslyn. Especially when summer heats up, I think people are going to really appreciate being able to get around in air-conditioned comfort without having to take Metro or walk." The Sprynt service will operate Monday through Thursday, 3-9:30 p.m., Friday, 3-11 p.m., Saturday, 11 a.m.-11 p.m., and Sunday, 12-8 p.m. Service in Rosslyn will begin in April. Stay tuned for more info! Thoughts? Questions? If they're not answered by this FAQ page on Sprynt's website, email rosslynbid@rosslynva.org.